Once again Hollywood takes to the slopes to kick off the annual Sundance Film Festival! From January 24th- February 3rd Park City will be over run with filmmakers, actors, influencers and brands setting up the most amazing activations. Check out our IT list of where to go for the 2019 Sundance Film Festival! Vulture will return to Park City, Utah, with its exclusive media studio the Vulture Spot for a third year in a row from January 25–28, where editors will interview and photograph top talent from Sundance’s most anticipated films. The video and photo content produced inside the studio will be showcased on vulture.com and Vulture’s Instagram, Facebook, and Twitteraccounts over the course of the festival and beyond. Sponsors for the Vulture Spot include Autograph Collection Hotels, Roku, and Woolrich. In addition, Autograph Collection Hotels and the Cut will co-host a “How I Get It Done at Sundance Film Festival” panel, the Cut’s recurring event series about work/life balance, ambition, and success. Autograph Collection Hotels and Vulture will reunite that evening for an intimate celebration championing the philanthropic efforts of the Art of Elysium together with David Arquette and Shanola Hampton. Wrapping up the weekend, Vulture will host a brunch celebrating Girls Weekend, as well as IFC’s Documentary Now! after-party, co-hosted with IFC. GLAAD is kicking off the festival with the 30th Annual GLAAD Media Awards Nominations Announcement 8AM on Friday at the AT&T Hello Lounge on Jan.25th. 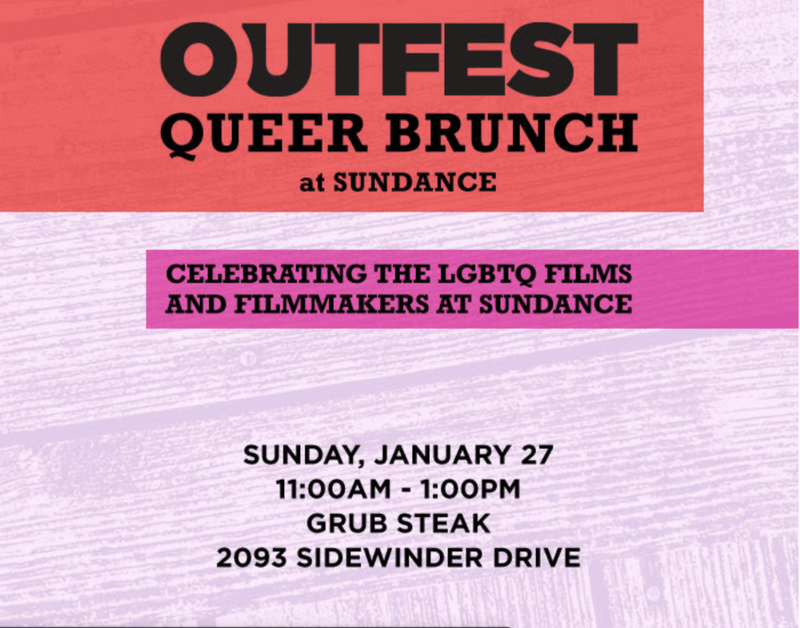 Throughout the weekend GLAAD will have a slew of events to highlight the LGBTQ community in film including the Outfest Queer Brunch! Stay tuned for the special announcement from GLAAD. Last year Chloe Grace Moretz, as well as many other celebs made an appearance. The festivities for the brunch take place from 11-1 on Jan.27th at GrubSteak! Another event to add to your list is the highly anticipated panel: GLAAD + Sundance Institute present Beyond the Transition Narrative: Transgender Storytelling in the 21st Century, which takes place on Jan.29th at 4:30PM. The Fly Lounge Rejuvenation Station and Hangover Haven presented by cannabis networking software NUGL. The lounge will also showcase the hottest beauty brands for a nice pick me up! GBY Beauty will showcase the hottest beauty products on the market. Guests can also enjoy a full-service smoothie, fresh juice and vegan Bloody Mary bar, while Crater Lake Spirits will be sampling Crater Lake Whiskey and other adult beverages and also check out the VR experience! Additional sponsors of the event include: Muscle MX CBD, Mandala Integrated Medicine, Digipath, CannaComforts, and Ablis CBD Infused Sparkling Beverages. The Kia Telluride Supper Suite is a MUST! Celebs and VIPs Will Be Chauffeured in the New Eight-Passenger SUV! Photo Courtesy of The Influence. The Kia Telluride Supper Suite by Greene St. Kitchen, of Las Vegas’ PALMS Resort, will activate a stand alone lounge on Main Street in Park City for the 7th consecutive year, and play host to a series of intimate filmmaker dinners, film parties and a daytime media lounge with coffee bar. As Kia’s first eight-passenger SUV, the Kia Telluride will also treat celebrities and VIP media with a door-to-door chauffer-driven car service. Each year, the Kia Telluride Supper Suite and its partners serve as the premiere hospitality and fine food destination and celebrates the top films and Hollywood A-list attending the film festival. In addition to the highly anticipated culinary highlight by notable chef Lanny Chin, and the gifting suite presented by MOU, guests will be able to enjoy beverages from Tequila Comisario®, Sensi® Tuscany Wines, Blue Moon Belgian White, water from LIFEWTR, as well as coffee from DragonFly Coffee Roasters who will also furnish a deluxe coffee bar day and night inclusive of a signature dessert blend. AT&T Returns to the 2019 Sundance Film Festival for New Culinary Experience and Entertainment Hotspot on Main Street. AT&T and DIRECTV will also host daily lunches for celebrities and tastemakers, premiere parties, industry panels and cast dinners for some of the festival’s most buzzed about titles. The DIRECTV Lodge will feature Italian favorites from Jon & Vinny’s Italian Restaurant, the famed Los Angeles restaurant from James Beard Award-winning owners Jon Shook and Vinny Dotolo. The Variety Studio presented by AT&T will host its longstanding portrait and video studio from 9 a.m. – 6 p.m.
Photo Courtesy of Sunshine Sachs. Raise Your Glass is Canon's annual toast to the cinematographers of the 2019 Sundance Film Festival. The evening is co-hosted by American Cinematographer. Open to invited guests only. The five-day event is THE ONE you do not want to miss! Created by Mimi Kim, ChefDance brings everyone together to enjoy a decadent, fine meal prepped by reputable chefs while enjoying wine and tons of laughter. ChefDance is an experience that engages all of your senses. Wanderluxxe, once again, is delivering a full slate of events while at Sundance. This year the team is spearheading a Wellness Lounge AND a Filmmaker Lounge both presented by Essential Costa Rica. Essential Costa Rica will take over the space to transform it into the travel destination sought after by so many. Nestled between Nicaragua and Panama, Costa Rica offers visitors an abundance of unique wildlife, landscapes and climates – meaning a trip to this Central American country is anything but run-of-the-mill — its Pura Vida! The wellness lounge will operate daily from 11:00am - 4:30pm, with 10:00am daily scheduled yoga sessions by lululemon, a daily Apres Ski from 3-5pm featuring a Costa Rican spiked coffee bar with Kobricks, Peroni, Tito’s Vodka cocktails, and ice cream treats by My/Mo Mochi Ice Cream. While the Filmmaker Lounge will showcase an array of film premiere parties, performances, events and panels such as "Diversity Representation," "Women in Entertainment" and "Industry Innovation" led by our exclusive media partner TheWrap on January 26th and 28th, including a kick off happy hour to the festival on the 25th with TheWrap and Costa Rica. Both lounges will provide that perfect oasis to escape from the chilly temps! This is one list you’re going to want to be on! The launch party for We Rise Up is surely highly anticipated. Taking place at Tao, the area will be transformed from the previous nights debauchery and refocused to offer music performance from Michael Franti, spoken word as well as movie clips and a panel discussion. 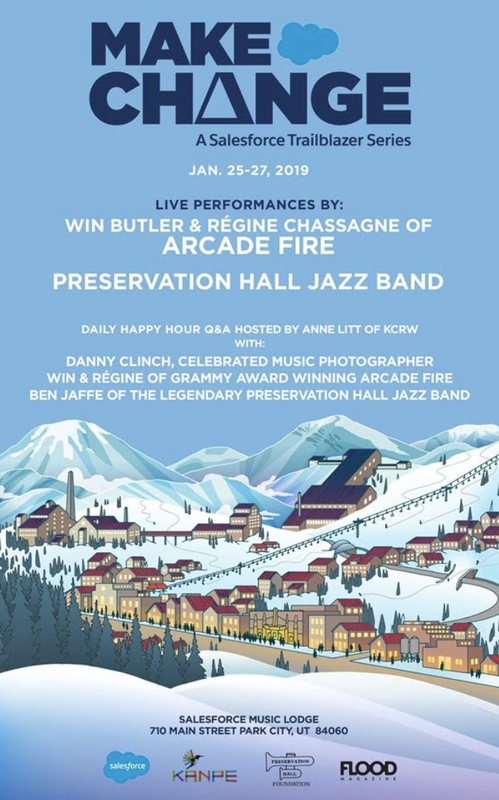 It’s a 3 night celebration of music as a platform for change that will bring together some great artists (Arcade Fire’s Win Butler & Régine Chassagne, Danny Clinch, Preservation Hall Jazz Band) for intimate conversations/performances to benefit various philanthropic causes. Invite-Only: The event will celebrate women in the industry at the Dell Den on Main Street during the Sundance Film Festival. The event will feature a fireside chat with the women of Before You Know It including star Judith Light, Director/Co-Writer Hannah Pearl Utt, and Co-Writer Jen Tullock. The conversation will be moderated by Marie Claire contributor and award winning journalist, Jo Piazza. Photo Courtesy of Debbie Durkin Entertainment Group. When attending Sundance stopping by Debbie Durkins' Eco-Luxe Lounge is a no-brainer. It's the perfect hub to take a break in between films and grab a bite to eat and catch up on the latest products. This year, guests will enjoy bits from Chef Dean Hottle of Snake Creek Grill in Heber will be serving brunch: 10am - 1pm, then lunch ( 1pm-6pm) including appetizers. Tekila Mexican Grill & Cantina will be onsite offering chips and salsa as well as showcasing other family specialties while enjoying spirits from sponsor, High West Distillery which include: Casa Noble Tequila, Svedka Vodka,The Real McCoy Rum & Rye, and wines from Robert Mondavi, Meiomi Pinot Noir & Chardonnay, Ruffino Prosecco, Charles Smith, Kim Crawford and MT Veeder. Additional beverages include: Stella Artois and Red Bull. Washington DC Senator Paul Strauss hosting interviews in support of his 51 State Initiative. Tony Toscano, Utah's premiere film critic on ABC4 Utah is hosting his "Talking Pictures" media center interviewing the 2019 Film Premiere Stars. Product showcases: Dr. Trevor Cates organic skin care, Stevie Wren Fine Jewelry, Author/Hypnotist Kimberly Friedmutter and more. Preserve Our Wild Foundation is the Non-Profit Charity Partner this year, and will be raising awareness and donations, founded by British Royalty, Lady Victoria Hervey. The media center for the lounge will include: ABC4 Utah, BudTrader TV, DJ Eric Jensen on radio KUAA 99.9fm in Utah, a non profit multi-cultural community radio, and more. Friday, January 25 through Tuesday, January 29 12:00 PM – 6:00 PM. The brand will be returning as a Sustaining Sponsor and will be hosting Canada Goose Basecamp, open to the public. With events, surprise guests and an invitation only lounge, Canada Goose Basecamp is your escape from the cold. Discover the brand’s long-standing relationship with film through an interactive exhibit, try on the brand’s iconic parkas, enjoy hot beverages and stay connected with complimentary Wi-Fi and power charging stations. Basecamp’s Second Floor is accessible by invitation only or with press credentials and will serve as a VIP lounge for Canada Goose fans and loyalists, as well as a coworking space for filmmakers. Spyder, one of the world’s most recognizable active brands will host a pop-up shop during Sundance Film Festival in Park City, Utah on Friday, January 25th to Sunday, January 27th. The pop-up shop will introduce an exclusive Spyder x U.S. Ski Team collection consisting of printable t-shirts, hoodies, outerwear and accessories featuring the U.S. Ski Team logo for men and women. In addition, select VIP’s at Sundance will experience an opportunity to train like an Olympian at the U.S. Ski and Snowboard Center of Excellence. Let us know your favorites in the comments! Hope to see you in Park City!